Officials at Tradepoint Atlantic say a study of a proposed public financing deal with Baltimore County should be made public in the next couple of weeks. WYPR Morning Edition host Nathan Sterner discussed that with reporter John Lee. Sterner: John, what is being considered? Lee: Tradepoint Atlantic is developing the old Bethlehem Steel site at Sparrows Point in Eastern Baltimore County. And they say they need a massive upgrade of infrastructure, like roads, water and sewer. They say that’s key to attracting businesses and the jobs that come with them, especially manufacturing. So they are proposing a TIF, which stands for Tax Increment Financing. When the proposed TIF was first announced earlier this year, it was estimated it could be as much as $150 million. But at a community meeting last night, Tradepoint Vice President Aaron Tomarchio said they’ve been negotiating with the county what infrastructure improvements they need. Lee: TIFS can be controversial. How it would work is that the increased taxes Tradepoint Atlantic would pay as the property develops would not go into the county’s general fund, but instead would pay off the bonds used up front to help finance the infrastructure on the 3,100 acre site. That means the water, sewer and road improvements would be built more quickly, so the property develops faster which would mean more taxes to the county. But the flip side of that is that that tax money used to pay off the TIF bonds is not going into the county’s general fund, where it can be used for things like schools and public safety. Sterner: What are county officials saying about it? Lee: Tradepoint is in Republican Councilman Todd Crandell’s district. He and other members of the Council are waiting to see the details of the TIF study. Lee: One person who attended last night’s meeting asked about any sort of community benefit agreement, where in exchange for the TIF, Tradepoint would pay for some projects in the community. Tomarchio said that is being discussed but he added the main community benefit is the thousands of jobs expected to come from the ongoing development of The Point. Also Nathan, plans were announced last night for a permanent Sparrows Point exhibit at the Baltimore Museum of Industry on the history of Bethlehem Steel. Sterner: What will that include? Lee: Archivists will be going through the old records. They’ll be going into neighborhoods collecting oral histories. The exhibit will include photographs and artifacts. Many of the people at last night’s meeting have connections to Bethlehem Steel. Either they or someone in their family worked there. That was not lost on Anita Kassof, who is the Executive Director of the Baltimore Museum of Industry. Lee: Kassof says 2019 will be the year of Bethlehem Steel at The Museum of Industry. They will begin with a temporary exhibit of photographs of retired steel workers in the Spring. 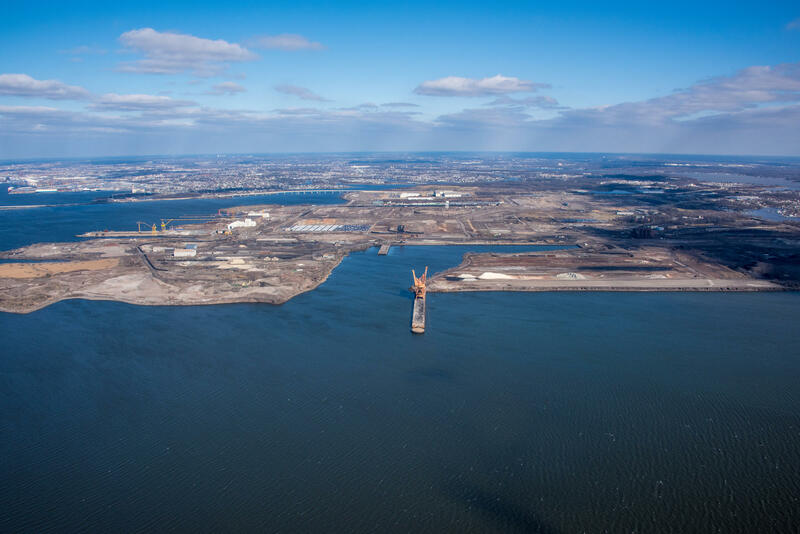 Tradepoint Atlantic, the developer of the old Bethlehem Steel site in Sparrows Point, plans to ask Baltimore County for up to $150 million in tax increment financing, also known as a TIF. The developer says it needs the financial help from the county for roads and water and sewer systems.